To celebrate the preorder of my chapbook, UPROOTED, (see the last post for more information on the exclusive preorder bonus) I’m hosting a big ol’ contest. UPDATE: With four days left to enter the contest, odds are still really great. If you haven’t entered yet and don’t want to put much effort into trying to win, you can get the easy single-entry by simply commenting on this post. I am also adding a few more surprises for the big winner, so enter while the entering’s good. Or something. 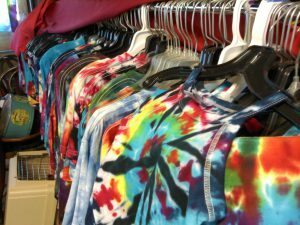 A handmade tie dye shirt of your chosen size (we have over 200 shirts from small to extra large, including a few kid’s sizes and sleeveless). Free access to the exclusive preorder bonus materials for “Uprooted.” If you have already preordered my chapbook, you’ll receive a second horror magazine of your choice in place of the preorder materials. 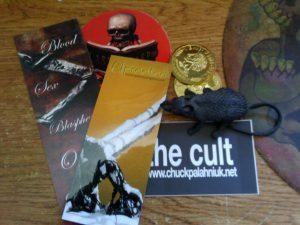 Remember those seven exclusive signed “Uprooted” bookmarks that you can only get by being randomly selected after preordering? Well, I hid one away to give to the winner of this contest. One of my pet rubber rats. His name is Frank. 1 Entry: Tweet the following comment, or a similar one of your own construction. Once you have completed your desired entry methods, just send an e-mail to HorrorWriterContest (at) gmail (dot) com. In the e-mail, leave your name, the username you posted your blog comment under, and your e-mail address so I can contact you if you win. Also attach links to your blog post and tweet if you did those entries. The contest will run until the end of the preorder window: March 13th, 2011. At that time I will assign all entrants unique numbers (varying depending on how many entries they have) and use random.org to choose a grand prize winner and second prize winner (if we get more than 50 entrants). TIMING: Contest begins at time of this post and ends at 5 p.m. EST on 3/13/11. DRAWING: The drawing will take place within 5 days of Contest end. NOTIFICATION: Potential winners for the prizes awarded at the conclusion of the Contest will be notified by email within about 6 days of drawing, and must reply by email within fourteen (14) days of email notice.